This is San Antonio. It’s Summertime. It’s hot. But this is a GREAT time to see some of our AMAZING art exhibits. San Antonio is an art-lover’s paradise. Whether you are moving here or just visiting, here are five top art experiences you won’t want to miss. If you only see one art exhibit in San Antonio, it must be The McNay. Since its 1954 inception, the museum has housed works of modern art by masters such as Paul Gauguin, Vincent Van Gogh, Georgia O’Keeffe, Pablo Picasso, Jackson Pollock and Pierre-Auguste Renoir. Founder Marion Koogler McNay, an artist and educator, steered the institute to become a vital partner in arts education in San Antonio. Every year more than 45,000 students of all ages take advantage of its art education programs and educational resources. A 45,000-square-foot extension was recently added that includes a sculpture garden. The grounds are works of art in their own right. The first Sunday of the month is always free admission. The Blue Star Art Complex is a hub of art activity in south San Antonio. The group of historic warehouse buildings have been transformed into an arts-oriented mixed use development, complete with a blues bar, home-cooking restaurant, galleries, retail shops, performance spaces, and living areas. Walk around the corner to view one of San Antonio’s amazing murals. 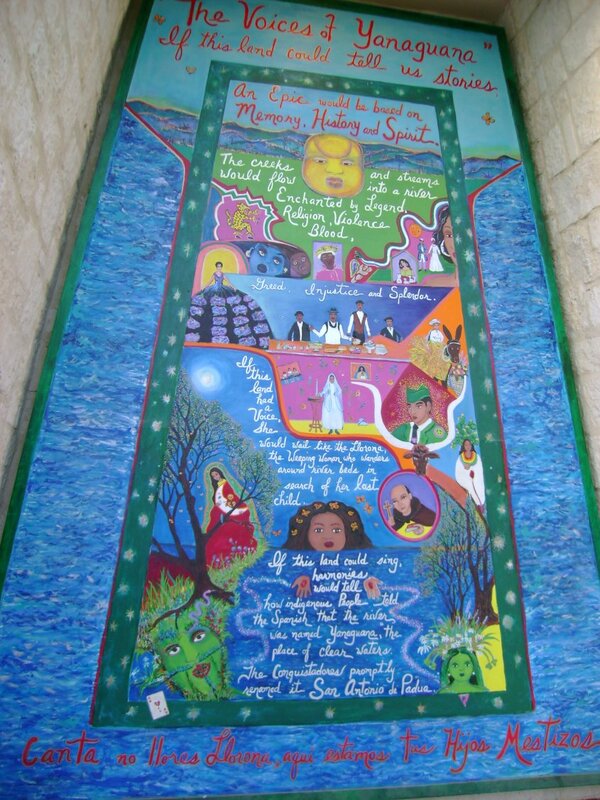 Painted on the wall of the Insco Distributing Building, the mural depicts the history of San Antonio from the days of the missions to the 1968 World’s Fair and the present. Then walk across the street to visit the non-profit center, Say Si, a year-round, multidisciplinary arts program that provides San Antonio students with opportunities to develop as artists and prepare for professional careers. The program has regular exhibits and performances. Their “Dia de los Muertos” event is a treat you won’t want to miss. One of the city’s newest venues is a public art display that is part of the Museum Reach project on the San Antonio River. Stroll down the river or ride the river taxi and you will be serenaded by birds under the Jones Avenue Bridge. You will also spy floating three-foot-tall, multi-colored fish hanging from the bridge near Camden Street. Sit on a bench near the head of a giant stone tribesman as water gushes from his mouth and rushes into the river below. Visit at night, and you can see the reflective light display under the Lexington Avenue Bridge. This string of outdoor exhibits is a delight for young and old alike. San Antonio hosts numerous weekend art events throughout the year. The oldest event, The Starving Artist Show is held downtown at La Villita in late April or early May, and features the works of more than 100 artists. Most other events, including the relatively new, Fred Road program, occur in March, the officially decreed art month. On-Off Fred Road happens in several neighborhoods in central San Antonio. Purchase a catalog of exhibits with a tour map for best use of your time. It would be difficult to see everything in one day. Several public parties with live music are included in the weekend event. National Autonomous University of Mexico (UNAM) is the only extension of a foreign university in San Antonio. UNAM offers lectures, panel discussions, films, exhibits and book fairs about Mexico. Located next door to UNAM, on the grounds of Hemisfair Plaza, the Institute of Mexico displays world-class Mexican artists, including Frida Kahlo and José Nuño. New exhibits arrive at least six times per year. Admission to the Institute is free, but donations are gratefully accepted.